When you have service and repairs performed at a TECH-NET PROFESSIONAL AUTO SERVICE center, you're covered by a Worry-free Driving Nationwide Warranty. 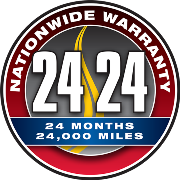 The Worry-free Driving Nationwide Warranty reaches across North America when you need it most providing vehicle protection on qualifying service and repairs. TECH-NET PROFESSIONAL AUTO SERVICE centers will protect your new car warranty and are committed to providing a successful and pleasant automotive service experience.